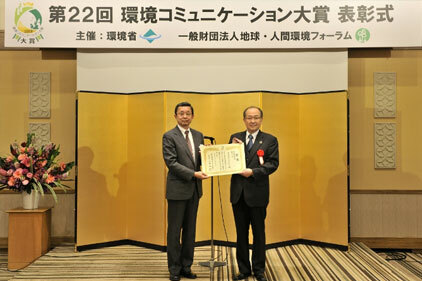 TOKYO, Japan – March 6, 2019 – Leading semiconductor test equipment supplier Advantest Corporation (TSE: 6857) has announced that it has won an Excellence Award in the Environmental Report division of the 22nd Environmental Communication Awards, co-sponsored by the Japanese Ministry of the Environment and the Global Environmental Forum. The Environmental Communication Awards are held every year to promote corporate environmental management and environmental communication activities through recognition of successful companies in these arenas, and to improve the quality of environmental information disclosure. This year, there were 196 candidates up for awards in the Environmental Report Division, and 118 in the Environmental Activities Report Division. Advantest’s Sustainability Report 2018 was chosen for recognition on the basis of its careful explanation of the company’s governance efforts, and its disclosure that the company has no environmental negatives: Advantest makes a practice of disclosing its environmental violations for the past five years, in which timeframe there were none. The award underlines Advantest’s consistent and proactive commitment to environmental responsibility and disclosure, and reinforces the company’s resolve to further enhance its environmental management and disclosure going forward.